Temple of Mathematics (Mathematicon) is a resource on general and philosophical/ontological rationalist idealist/mentalist/spiritualist mathematics, or mathematicism, i.e., maths as its own philosophy/religion from the Hellenismos (Greek philosophy/religion) schools of thought of Pythagoreanism, much ancient/pre-Socratic/Classical philosophy, Socratic philosophy & Platonism, Peripatetic logic, Neopythagoreanism, Neoplatonism, as well as the later philosophies of Cartesianism, Leibnizianism, Gödelianism, etc. 'Mαθηματικών,' i.e. 'Mathematicon,' is one of many Greek words for maths, and is the one generally used to refer to anything 'of maths,' such as 'ναός των μαθηματικών' ('temple of mathematics,') as well as having the ending 'on,' which is in many individual words for Greek temples such as Athenaions ('Temples of Athena') including the Parthenon, and Hermaions ('Temples of Hermes,') etc., thus the name 'Mathematicon' was chosen. 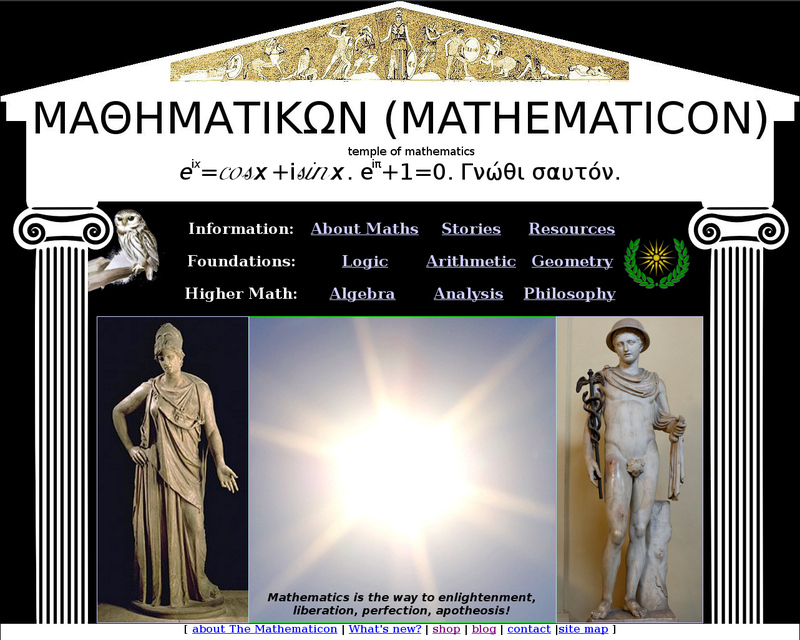 Mathematicism/Mathematicon (in old site design) was symbolized on the front page by the Olympians Lady Athena and Lord Hermes (or Hermes-Thoth, Hermes Trismegistus, after the Egyptian god Thoth,) the deities of maths and wisdom. At the top of the Mathematicon (picture of a building in old site design) a design from a temple of Lord Apollo, Olympian of reason & logic, and below it is Euler's Formula & Identity (a.k.a. The God Equation & Soul Formula) and the Greek statement 'Γνώθι σαυτό,ν i.e. 'Gnothi sauton,' or 'Know thyself' which was on Apollo's temple at Delphi. If it had not been for the Enlightenment Age Apollonian philosophy of the temples of reason, Mathematicon might not even exist. The idea of a temple of maths is influenced by the historical temples of reason, therefore Apollo and the other gods of intelligent ideas can be said to represent maths because their ideas are related (reason, wisdom, craft/engineering/science, etc). (Neo)Pythagorean/(Neo)Platonist/Leibnizian mathematicians and serious mathematicists may request a homepage and forum, microblog, blog,) wiki account at The Mathematicon. Mathematicon is designed and tested on Free/Libre/Opensource Software (FLOSS) web browsers. Mathematicon was written by Math Hero, redesigned by Matheros. The updated logo was designed by Math Hero and programmed by cantelope (not affiliated.) Thanks to Viator Lapis for advice, such as a correction. You can link to Mathematicon and Mathematics.chat with banners. Mathematicon does not recommend you use Facebook but has Facebook Mathematicon, Mathematics Religion, and Princess-Goddess Athena Olympian pages.